Welcome to this edition of the Productive Business Magazine Blog – The power of collaboration. Its an honor and a pleasure to bring to you the best and the brightest from all around the world as we talk productivity in business. Today I have the pleasure of introducing you to a good friend of mine, Ambassador Dr. Clyde Rivers. In the 1980s Yamaguchi and his associates came to the conclusion that using a cryosauna, (also known as a cryotherapy chamber or a cryotherapy unit), for rapid short-term freezing of the skin’s surface has a more beneficial effect on the human body than its gradual cooling while immersed in an ice bath. Further study in Europe over the last 3 decades has established whole body cryotherapy as a powerful therapy for, and recovery from, a variety of conditions. PBM: Welcome Sean Swaringer How are you doing today? Sean Swaringer: Hey man, I am glad to be back? But I’m doing great. PBM: Give the listening audience a little background on who you are, what you do, where you’re coming from before we get started. Sean Swaringer: Well, basically I’ve been in Arizona for the last eight years and I started my business a couple of years ago with Cryoworld Therapy and we are the number one leading Cryotherapy place in the valley. We offer an alternative treatment for pain relief. What we do best is helping people recover from pain, fibromyalgia, rheumatoid arthritis, and all the different aspects of pain and inflammation. We are here to help you, by doing what we do best and that is being productive. PBM: Awesome, you and your beautiful queen, Mrs. Vanessa Swaringer are doing some outstanding things out there. I know that you all have moved to a new location and many big things happening. We’re going to flip the script a little bit before we tell people about all of the things that you have going on. I’m going to ask this question. I want you to tell the listening and reading audience, how did you even get involved in this industry? This is going to blow your mind folks. Sean Swaringer: Well, basically it happened a few years ago. I’m sitting down watching TV and you know they say things happen by chance, but I think it happens on purpose. You know, you see things and then you react to it. What happened was, I saw LeBron James on TV talking about how he recovers from inflammation and pain. I looked at that interview and he talked about cryotherapy, which is a new treatment that’s out here that people had not really heard of, but it replaces the ice bath and put you into a cold chamber to recover from inflammation and pain by actually just cooling down your skin temperature. So I looked at that interview again the next day I and I turned the TV back on and then again there was another celebrity talking about their use of Cryotherapy and what they did and then I actually looked at what went on with the process and how it helps your body. I was intrigued by what I saw and wanted to learn more because my wife used to run track and would have pain in her hip. So we decided to research cryotherapy a little bit more. We went to a two-day seminar and took a closer look at it. So we did it the first time and we only stayed in the chamber for about a minute and a half. When she came out, she informed me that her hip was not hurting anymore. I was in disbelief because she had been in so much pain for so long. The next morning, we got up, and went to the remaining portion of our two-day seminar. Before heading back to Phoenix, we tried it one more time, and we stayed in for about, almost three minutes. She has not had a problem with her hips in over two years. It removed all the inflammation and pain that she was feeling in her body. Since then, some other things have happened to myself as I’m getting a little older. As we get older, we get these little aches and pains and so on and so forth. I have become an avid believer of what cryotherapy can do because it is a remover of inflammation and pain. People suffer from so many debilitating forms of pain and inflammation. I have back issues and I get Cryoed after I get into Cryosauna; immediately my back stops hurting. You have to try it to believe it, but I’m telling you right now, there are really hundreds of thousands of people who have tried cryotherapy and they know that it works for them. PBM: Talk about a story. I know many entrepreneurs who are listening to this show, they’re going to be like, oh my goodness, come on man. I don’t want to hear that. Yeah, you went to some conference. You tried that thing one time and really, it really work for you like that? See, this is what I love about business and about productivity, evidence and results do not lie. Folks, listen, the husband watched the wife go through it, who had pain and he was like, okay; all right. You go back a second time and then you do it and you’re like, oh, maybe there’s some validity to this. You know Dr. V doesn’t bring you any mess. I only bring you the best and the brightest. I’m talking about things that you can actually take to the bank. All right Sean, so let’s talk about this thing. The number one alternative to pain relief over the new buzzword opioids; talk to us about that. Sean Swaringer: I will tell you something, Opioids is nothing more than a Band-Aid. It just puts a bandage on it, but anytime you could do something organically and let your body heal itself, this is the number one way that you can get over any pain that you may have in your body. The reason why it happens is, to put this in layman’s terms. When your body’s skin temperature gets cold, it moves the blood from your extremities to your core to protect your heart, liver, and lungs. Your brain says something is going on with my body because I’m extremely cold. When that happens, your blood moves the inflammation which is stagnant. Anytime you get your blood moving, then we have what they call vasocontraction. But once you get warm, the blood flows back from your core to extremities, causing a massive blood circulation, sending nutrients, oxygen, and enzymes to the area body that’s inflamed. Now all that means to you is that a massive blood circulation sending nutrients and oxygen to those areas that are inflamed. What that means to you, that blood is not stagnant anymore. It’s moving throughout your system and the inflammation is now moved from the area that you had pain in. PBM: Come on, man. This dude just actually broke down the science of cryotherapy for you and like a minute and a half. Are you freaking kidding me guys? Listen, I’m not a medical doctor. I don’t subscribe to be, but what I’m telling you is I to. What was that old commercial that they used to say, I’m not just the client, right? That I forgot what it was, but it was a hair day. I can honestly say that I not only am talking about Cryotherapy on this interview, but I have experienced Cryotherapy as a combat veteran who has had over seven surgeries and one of which is back surgery. I can honestly say that after experiencing Cryotherapy, I’m a raving fan! I need you all to hear me. Dr. V, doesn’t promote everything, but I’m telling you that Cryotherapy is the truth. Try it out! You may not live in Arizona. You may be listening to this and say, how can I get a hold of this Cryotherapy thing? Sean Swaringer: If you’re anywhere else in the world, there’s a directory called cryotherapylocations.com. You pulled that up, that tells you every cryotherapy, places in your area, in your city, state and so on and so forth. The thing I’m most proud about Cryotherapy, we’ve been in business for almost two years and we have seen, and have done over 3000 therapy sessions. So the word is out. People hear about it, but they just don’t know. We’re imploring you. 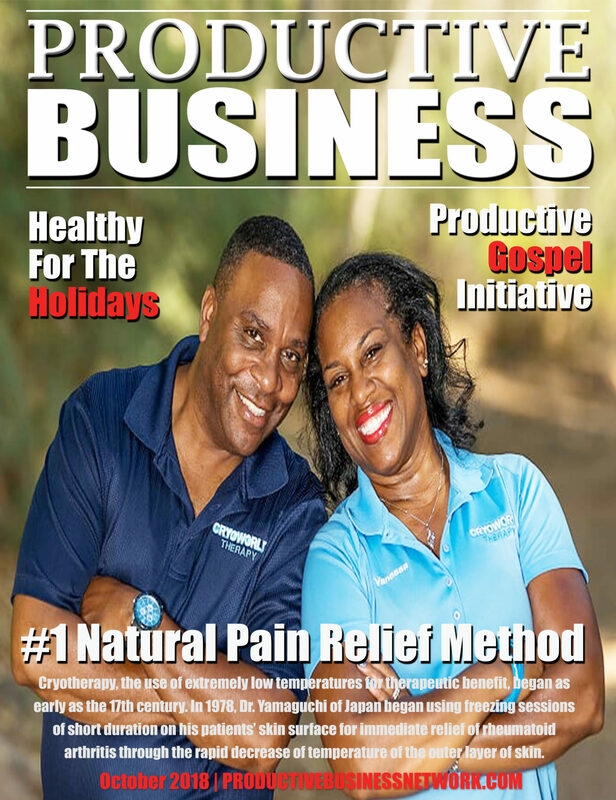 If you suffer from pain, inflammation, opioid use, and you want to get off those meds and go into a natural way of healing your body, check out Cryotherapy because this is the number one treatment that you can do that helps your body recovered naturally. Its all about being productive. That’s what we do. PBM: My goodness, you’re speaking my language. Listen, I want to talk to the people about the different types of cryotherapy. I know you all are in the facility right now. I want you to begin to tell us a little bit about the different styles of Cryotherapy when they come to the facility. It’s not simply only the whole-body cryotherapy, but there are multiple ones and Vanessa is available after you’ve explained some. I would love for her to break down the Cryoskin. Sean Swaringer: I can do that for you, cryotherapy has different aspects, in different variables. We have the whole-body session. Where you get your whole body into a Cryosauna, we have the localized cryotherapy which is nothing more than if you have an issue with a specific are like: your knee, your ankle, your wrist, your back, your shoulder. It works with a machine that actually concentrates on a localized area; this machine is like an ice pack on steroids. We’d get your skin temperature all the way down to about 35 to 40 degrees, which causes it to attack the inflammation in that area. We see pitchers, boxers, hikers, and cyclists to name a few. We see all kinds of athletes from softball to high school to junior high school. Our youngest person that we have is nine years old who’s a boxer. He’s a junior Olympic boxer, who comes in for his body or hands because he’s boxing all the time. These other services that we have are all cryo-related based on just the science of cold air hitting your body and healing your body. PBM: I’m sitting back thinking right now, wait a minute, you’re not only telling me that I can come in, but I’ve also got a wrist fracture or whatever the case may be, my doctor’s been trying to prescribe me opioids, so on and so forth. I know that over time that stuff is not good for my body. You’re telling me right now, that it is possible for me not to have to take drugs, but actually, use cryotherapy to help me. PBM: If Vanessa is available, I’d love to talk about Cryoskin. There’s a new program that you all have, that you’re providing at your new location called Cryoskin. Would you break that down for us and help the people to understand it’s miracle benefit? Vanessa Swaringer: I hear you want me to explain a little bit about Cryoskin? Absolutely. Well, this originated in Paris, so they’ve been doing this for many years and it’s to help get rid of that stubborn fat which many of us suffer from especially working out trying to eat clean and it just won’t move. It’s a very simple process. This is how it works, the Cryoskin wand warms the skin bringing fat cells to the surface before rapidly causing apoptosis through crystallizing the fat cells. The dead fat cells are then circulated out of the body via the lymphatic system. Most people notice a .5 – 1.5 inch reduction of the treated area immediately after the session. PBM: Stop the presses, there is a cryo-application called Cryoskin, that will help you with the stubborn fat areas. Is that what I’m hearing you say? I know there are a lot of men and women listening to the show and reading the magazine, but this is the number one thing that people deal with. I’ve seen it with cool sculpting and liposuction, but the difference with Cryoskin is that you’re allowing your body to organically do what is necessary. Vanessa, would you break that down for us, because I need people to understand what’s going on. Vanessa Swaringer: Sure. Element, but it’s not an uncomfortable situation. And you mentioned CoolSculpting. My instructor as well as clients who I’ve had to come through our doors who have experienced CoolSculpting, they were not satisfied with the results. It’s a much, more expensive procedure and it’s very uncomfortable as I understand it. There is a clamping, with CoolSculpting of the area to be worked on and it stays clamped for an hour and then that part is actually frozen. So, there’s a lot of pain involved in that process along with unsatisfied clients. With Cryoskin you immediately see the results. The only thing that you need to do before the session is have no carbs or sugar two hours before and after, and of course drinking plenty of water because the fat is flushed out of your lymphatic system. If you can do that, then you know the Cryoskin will be great for you. I had it done myself because I needed to see if this really worked and I had one inch remove from my waist. PBM: Ok, once again there are times when you gotta pause for a cause. You just said that you had one inch in one session removed? Vanessa Swaringer: Yes, one inch was removed from my waist after one session. PBM: After one session, alright folks, I’m not selling any miracle pills over here. I’m just the person doing the interview. If you’re hearing or picking up what Vanessa is putting down, then the doors should be swinging back and forth. Open and close. Open and close. Okay, so let’s talk about this Vanessa, because I know that you guys are very productive there. You have a very full schedule. Talk to me about Cryoskin facials and things of that nature as well because the beauticians and estheticians want to hear and know about this stuff. Vanessa Swaringer: We have two other services with Cryoskin. One is the facial that you mentioned and it’s only 20 minutes. It tightens up the skin for one and it also speeds up the collagen production in your face and it minimizes it drastically. I have one client in particular, she works outside in this Arizona heat and she immediately noticed a difference in her skin and she’s been working outside for 20 years and she absolutely loves it. Cryoskin facials are the bomb and we also do the Cryoskin Toning. The toning targets, the cellulite that’s in our bodies, there’s no heating involved that process; it’s just strictly the cooling and it’s a different technique. Again, it’s only 20 minutes! I have clients who are runners, they run for miles and they could not get rid of the cellulite in their legs. They did multiple Cryoskin toning treatments with me and they are happily satisfied.